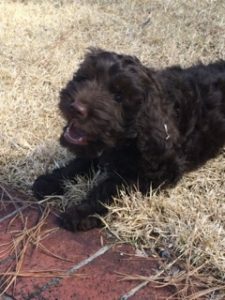 Winston is an 8-week old, male Labradoodle that is starting his journey to become a service animal for a CPT client in Texas. The client is a teenage female who suffers from seizure disorder and complex regional pain syndrome. 5) timelines and milestones for the client’s customized CPT service dog program. Once constructing customized specifications and receiving a retainer, our primary task became locating, evaluating, and selecting an ideal candidate dog for the program. The client preferred that we train a puppy. In contrast to selecting a young adult animal, working with a puppy extends the timeline for project completion, since we don’t place a dog in service until the animal is at least 18-months of age and has reached sufficient levels of physical and emotional maturity. Yet, on a positive note, a puppy provides us the advantages of working with a blank slate that we can mold from the earliest stages of development. In addition, the process of finding an ideal puppy is usually less arduous than the process of locating an optimal adult candidate. Winston prepares to start his journey. 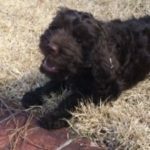 Based on the specifications of the program and the Texas client’s preferences for a dog with a low-shedding, hypoallergenic coat, we steered toward obtaining a Labradoodle. On January 25, we evaluated an exceptional litter of Labradoodle puppies and selected Winston as the ideal dog from within the litter. Today, Winston is leaving his mother and litter and starting his first of three board training stages. The first board train emphasizes housebreaking, household manners, environmental socialization, and imprint obedience and lasts for a period of one month. Winston will return in August for another one-month board train, where we will work on any remaining household manners and general manners issues, teach basic through advanced obedience, and continue his environmental socialization. Then, when he is 13 months of age, Winston will return for a 3 to 5-month board train, where we improve the reliability and responsiveness of his advanced obedience skills, teach his formal assistance behaviors, and generalize all his behaviors to multiple public, private, commercial, and residential environments. Between each board train we encourage the client to implement homework drills, management protocols, and socialization activities that maintain or further Winston’s preparation. After the final board train, we will spend 2 to 5 days with the client to ensure that she and her parents know how to properly handle and manage her fully trained service dog. Winston is starting the first leg of a 16-month journey. When he is done the road Winston traveled will provide many happy years for him and for our client.